A newly published set of 10 guiding principles for diabetes can be clinically useful in diabetes management and prevention. Presented by the National Diabetes Education Program (NDEP), Guiding Principles for the Care of People With or at Risk for Diabetes is aimed to identify and synthesize areas of general agreement among existing guidelines to help guide primary care providers and health care teams to deliver quality care to adults with or at risk for diabetes. 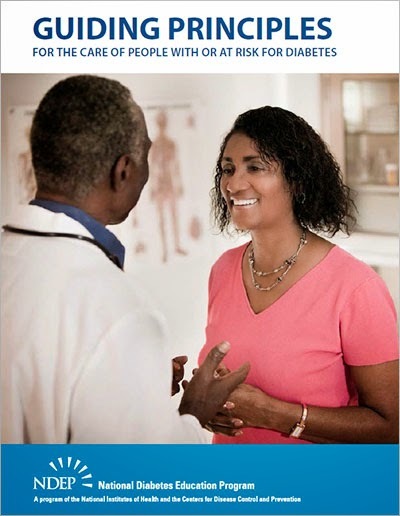 The ten principles cover topics including identifying people with undiagnosed diabetes and prediabetes, ongoing self-management education, individualized nutrition therapy, and blood pressure screening and control, among other topics. More than a dozen federal agencies and professional organizations support the document. November is National Diabetes Month 2014. Throughout National Diabetes Month, NDEP and its partners will promote “Be Smart About Your Heart: Control the ABCs of Diabetes” to help people with diabetes learn they are at greater risk for heart disease, and also how they can lower that risk by managing the diabetes ABCs: the A1C test, Blood Pressure, Cholesterol and Stop Smoking.